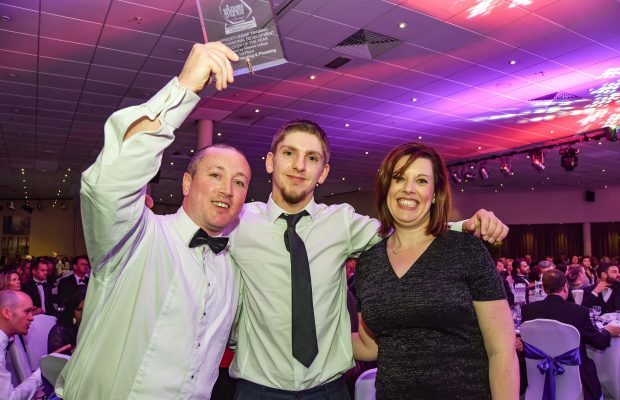 The team from heating and plumbing firm CentraHeat went above and beyond the call of duty when they responded to an emergency call-out en route to an awards ceremony – dressed in their dinner jackets! And to top it off, the team from CentraHeat went on to win Apprenticeship, Training & Professional Development Employer of the Year at the annual Wiltshire Business Awards. Lee Flanagan, founder and managing director at Royal Wootton Bassett-based CentraHeat, said the call-out was to help a customer in West Swindon, who had a leaking toilet. “The whole team were just leaving Swindon on Friday evening to travel to the annual awards ceremony at Centerparcs when we received the call”, said Lee. “We didn’t want to leave our customer in the lurch, so we called in on the way to the ceremony. Our customer was very surprised to see us turn up in our dinner jackets! Lee said he was thrilled that CentraHeat had been recognised as Employer of the Year, coming first place in the Apprenticeship, Training & Professional Development award category. It is the second accolade this year that the company has received for its commitment to training and apprenticeships. In January, it earned a place in the prestigious Centrica Top 100 Apprenticeship Employer list, which is compiled annually by the National Apprenticeship Service and recognises excellence in businesses that employ apprentices. Last autumn, CentraHeat was runner up at the South West Regional Apprenticeship Awards, for the Small Business Employer of the Year category. CentraHeat currently has two apprentices in training – with three having fully qualified – and plans to take on another this year. For more information about CentraHeat, visit www.centraheat.co.uk or call 01793 878636.